From the Green Monster in Fenway Park, Boston, YMAA author Ramel Rones presents "Iron on the Wall" a stretch for weekend warriors and those who are "on the go." The stretch will help loosen your shoulder, arms, and neck. It is based on part of the Tai Chi move, "Close Tai Chi and Return to the Mountains." The 2:30 minute video will walk you through the stretch. Ramel Rones is a martial artist developing Mind/Body Therapies to help people deal with situations such as cancer, arthritis, aging, injuries and stress. He is the author of award winning book, Sunrise Tai Chi and companion DVDs Sunrise Tai Chi and Sunset Tai Chi. Update 1: New Leg Strength and Balance video posted. 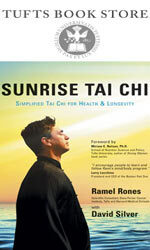 Tufts School of Medicine is featuring the book Sunrise Tai Chi in their monthly newsletter and online store this month. The Sunrise Tai Chi form was used at Tufts School of Medicine in an R-21 study to determine the benefits of tai chi for osteoarthritis of the knee. YMAA author Ramel Rones has worked with the NIH since the 1990s promoting the synthesis of western medical science and the eastern healing arts. Mr. Rones also recently designed and taught a 12-week tai chi study to benefit patients with fibromyalgia, using his popular Sunset Tai Chi form. The findings were reported in the New England Journal of Medicine, which marks the first time tai chi chuan has been validated as a healing modality in such a prestigious medical publication. The winners of the YMAA Anniversary contest have been announced. Congratulations and thanks to all those who participated. YMAA schools were founded October 1, 1982. YMAA Publishing was founded in January 1984. The 2011 YMAA catalog marks 27 years of publishing. Find out the winners and read the answers to the contest questions, such as " What are the Five Regulatings in Qigong?" and "What Chinese kung fu style is the root of goju ryu karate?" 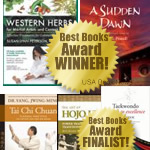 YMAA Recipient of Five USA Book Awards—Two Winners; Three Finalist in "Best Books 2010"
Three YMAA Publication books received the Finalist Award in “Sports: General” Tai Chi Chuan Classical Yang Style—The Complete Long Form and Qigong by Dr. Yang, Jwing-Ming; The Art of Hojo Undo—Power Training for Traditional Karate by Michael Clarke; and Taekwondo—A Path to Excellenceby Doug Cook.” Over 500 winners and finalists were announced in over 140 categories covering print and audio books. Awards were presented for titles published in 2010 and late 2009. Dr. Yang, Jwing-Ming will tour Europe offering seminars beginning this October 2010. You can read more about his classes in Ireland (Dublin), France (Paris), Austria (Graz), Poland (Krakow), Belgium (Brussels), Italy (Napoli/Naples), and Portugal (Lisbon) at this link. This past July, twenty-one members of the Chosun Taekwondo Academy embarked on a quest to enhance their skills in traditional taekwondo with a trip to Korea—the Land of the Morning Calm. They were led on their journey by head instructor and 5th degree black belt, Master Doug Cook and accompanied by martial arts pioneer Grandmaster Richard Chun, 9th degree black belt and president of the United States Taekwondo Association. Journeying with the group was Master Erica Linthorst. She and Doug Cook wrote a seven-part travelogue about their adventures with photos by Patty Cook. The tour included training at the Kukkiwon, International Kumgang TaeKwonDo Center, and with trips to ancient Silla, Seoul, National Museum, the Golgulsa Temple and others. Comments And Videos From 'Crossing the Pond Martial Expo"
YMAA Publication Center supported the inaugural Crossing the Pond Martial Expo held Aug. 14-15 in West Seattle. The second was held Aug. 21-22 in Coventry, UK. This expo brought together six well-known and highly-skilled instructors of martial arts and self-defense from across the United States and the United Kingdom. Workshops were held by YMAA instructor Nicholas Yang, YMAA authors Kris Wilder and Rory Miller. Other instructors for the expo were Al Peasland, Marc “Animal” MacYoung, and Iain Abernethy. YMAA author Ramel Rones is featured in a New York Times article "Tai Chi Reported to Ease Fibromyalgia" on August 19, 2010. The story was picked up in the news and major tv networks like CNN, after the results from a study at Tufts Medical Center were published in the New England Journal of Medicine. The 12-week study, designed by Ramel Rones, concluded that regular Tai Chi practice can help patients with Fibromyalgia, a chronic pain condition which causes fatigue, insomnia, and depression, and impairs physical function. Ramel's most recent Sunset Tai Chi DVD focuses on the short form used in the Fibromyalgia study. YMAA would like to congratulate Ramel for his continued work, since the early 1980s, in bridging the gap between eastern and western healing modalities. YMAA author, Master Doug Cook, 5th degree black belt and Grandmaster Richard Chun, 9th degree black belt and president of the United States Taekwondo Association, recently returned from a trip to Korea: Land of the Morning Calm. Twenty-one students accompanied them to the birthplace of Taekwondo. Each day presented a diverse and challenging training opportunity with instruction from world-famous grandmasters as well as visiting sites of interest. There are more details about this trip at the Chosun Taekwondo Academy website. Several Retreat Center students competed in Kung Fu magazine's annual martial arts tournament in Santa Cruz, CA on June 12th. Jonathan Chang ranked 1st in Traditional Northern Fist (Adv. ), 1st in Taijiquan (Adv. ), 1st in Traditional Short Weapons (Adv. ), 2nd in Traditional Southern Fist (Adv), 3rd in Taiji Short Weapons (Adv), 5th in Traditional Long Weapons (Adv) and has unknown placement in the WildAid Division. Santi Costello ranked 1st in Traditional Northern Fist (Int.) and 1st in Traditional Long Weapons (Beg.). And Javier Rodriguez ranked 3rd in Taiji Pushing Hands and 3rd in Taijiquan (Int.). Special thanks to Michelle and Zaida for taking the photos and to Gene Ching for his continued support. Congratulations to all those involved! Watch the new Nicholas Yang video now on YouTube. Nicholas will be a featured instructor in the first annual Crossing the Pond Martial Arts Expo, 2010! The events will take place Aug 14-15, in Seattle, WA, USA and Aug 21-22, in Coventry, UK. Instructors include Iain Abernethy, Marc Animal MacYoung, Al Peasland, Kris Wilder, and Nicholas Yang together in one seminar in the UK and in the USA. Subjects include Chinese martial arts, Okinawan karate, street fighting, self-defense, and applied karate, all on one floor in a cross-training environment. The pre-registration deadline for the YMAA CA Retreat Center annual summer seminars is June 10th. 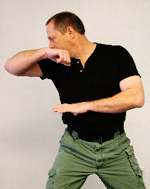 The seminars will cover the topics of Qigong, Tai Chi, Pushing Hands, and more. If you are interested in attending this year's YMAA California summer seminars with Dr. Yang, Jwing-Ming and have not registered yet, please do so as soon as possible by calling (617) 524-8892. Rooms are filling quickly, and there is only limited space. Additional information and seminar testimonials from past participants can be found on the Retreat Center website. Join YMAA members and martial arts enthusiasts for a week-long seminar on Kung Fu, Tai Chi, weapons, Qigong, and more. The annual YMAA Summer Camp will be held this year in Costa da Caparica, Portugal from July 26 - August 1. You can read more and register online. Food and lodging details are included. More details about this event can be found on the website, regarding Testing, Supplies, Weapons, and the environment. See video and more details on the YMAA Boston page here. "One World—One Breath" is the motto of World Tai Chi Day, a global health and healing wave in which over 60 nations participated on April 24. Dr. Aihan Kuhn, author of Simple Chinese Medicine, led students and those interested in martial arts in a free morning of Tai Chi and Qi Gong practice and demonstrations at Framingham Common, Mass. YMAA Boston enjoyed a gathering at the Arnold Arboretum and practiced the Yang style Tai Chi long form. See photos from the YMAA Boston WTCD day event. Kung Fu for Kids DVD Endorsed by KIDS FIRST! The Coalition for Quality Children's Media awarded the KIDS FIRST! endorsement to the Kung Fu for Kids DVD. CQCM is a national, nonprofit organization bringing quality children's media to the public. KIDS FIRST! evaluates, rates and endorses children's films, DVDs, and other media. Instructors Nicholas C. Yang and Ben Warner teach an instructional program that gives children the basics of traditional Kung Fu in a fun and exciting way, following the YMAA Kung Fu Kids curriculum. Congratulations to all those involved. 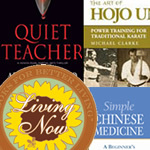 Several YMAA Publication books received The Living Now Book Awards presented by the Jenkins Group of Traverse City, Mich. A gold medal in the Men's Fiction category was awarded to Quiet Teacher by Arthur Rosenfeld. This book is the second in the series of the adventures of the Xenon Pearl. A silver medal was awarded to The Art of Hojo Undo—Power Training for Traditional Karate by Michael Clarke in the Exercise/Fitness category. Simple Chinese Medicine—A Beginner's Guide to Natural Healing & Well Being by Dr. Aihan Kuhn received a bronze medal in the Health/Wellness category. The awards recognize the excellence of newly published books in lifestyle categories. In all, 103 gold, silver and bronze medals were awarded in 30 categories, chosen from 428 total entries. Arthur Rosenfeld, author, Tai Chi Master, and Huffington Post contributor, appeared on Fox News Web broadcast Strategy Room on their Variety Hour hosted by Kimberly Gluilfoyle on April 22. 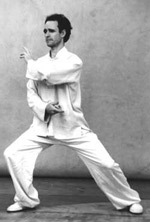 Rosenfeld demonstrated two Tai Chi exercises. One was a balance exercise where he could not be pushed off his mark, showing balance, connection, and mental stability. The other was an arm exercise, commenting that there are only two arm movements in Tai Chi. Watch this informative broadcast on Fox's website. Saturday, April 17th, YMAA Boston will be holding a Kung Fu and Tai Chi exhibition/demonstration at the school. This is a charity fundraiser event for St. Jude Children's Research Hospital. Come see the YMAA Boston world headquarters school, at 38 Hyde Park Avenue, Jamaica Plain, MA 02130. It is across the street from the Forest Hills T-stop, on the orange line. Rory Miller, author of Meditations on Violence, donated his time and recently gave a seminar, "Ambushes & Thugs" at MCC: Blue River Community College, Independence, Mo. The seminar was hosted by the Blue River Martial Arts Club under the direction of Eric Parsons, martial arts instructor and teacher at the college. YMAA Publication Center was the sponsor. Proceeds from the seminar were donated to the college's Single Parent Book Loan Program. Attendees came from all over the Midwest to attend this seminar. 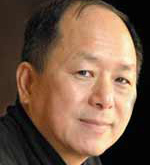 Next year in 2011, Nicholas C. Yang, president of YMAA International and principal Shaolin instructor at YMAA Boston will be the presenter. The YMAA Retreat Center students recently held a demonstration for the Salmon Creek Community School at the Center in California. Included in this demo are Santiago Costello, who is in a 3-month trial period for the 10-year program. Like Jonathan, Santi was originally a longtime student of YMAA Andover. Also in this demo is Manuel Pottek, a regular attendee of YMAA events. The students also edited a video, as part of their ongoing study of video production. YMAA is happy to announce that we now accept PayPal as a payment option in our Publishing online store. You don't need to have a PayPal account to buy from us; you can still use your credit card as normal — we accept Mastercard, Visa, American Express and Discover. If you need to, you may also mail your order with a money order or bank check, drawn on US Dollars, to YMAA Publication Center, Inc., PO Box 480, Wolfeboro, NH 03894. YMAA is serious about security and, by using PayPal, we are giving you another alternative to keep your transactions and personal information safe and secure. We hope you like this new feature. Five YMAA Publication books were announced as finalists in ForeWord's 2009 Book of the Year Awards. The finalists are: Quiet Teacher—A Xenon Pearl Martial Arts Thriller by Arthur Rosenfeld, June 2009, in the "Fiction General" category, Simple Chinese Medicine—A Beginner's Guide to Natural Healing & Well Being by Dr. Aihan Kuhn, May 2009, in the "Health" category, and The Little Black Book of Violence—What Every Young Man Needs to Know about Fighting by Lawrence A. Kane and Kris Wilder, April, 2009, in the category of "Young Adults Non-Fiction." Two books received recognition in the "Sports" category, The Art of Hojo Undo—Power Training for Traditional Karate by Michael Clarke, September, 2009 and Taekwondo—A Path to Excellence by Doug Cook, October, 2009. There were 240 finalists, 60 categories, and 1400 entries. The winners will be determined by a panel of librarians and book sellers selected form ForeWord's readership and announced on May 25 at the Book Expo America in New York City. ForeWord's Book of the Year Program was designed to discover distinctive books from independent publishers across a number of genres. Dr. Yang is featured in a new YouTube video interview by Kung Fu magazine. He tells a proverb he learned from his White Crane master about the true meaning of training martial arts. You can watch the video on YMAA's YouTube channel, or view the text version on Kung Fu magazine's website. Ambushes and Thugs is now only a few weeks away, Saturday, March 20 from 9 a.m. to 5 p.m. at MCC:Blue River Community College, Rt. 78, Independence, Mo. Some space is still available. Contact Eric Parson at Eric [dot] Parsons [at] mcckc [dot] edu or (816) 220-6746. And if you still need convincing on why you should come, check out this report on Kris Wilder's blog about Sgt. Miller's recent sold-out seminar, "Ambushes and Thugs" in Seattle, Washington. The YMAA Winter seminars were a great success, with many repeat attendees, and some new faces in each subject. Dr. Yang returns to teach in Boston and Andover every year during the month of February. Photos from the recent seminars are posted here. Dr. Yang will next be offering four days of teaching at the Santa Cruz Chi Center, hosted by Lee Holden (best known as the qigong teacher on PBS). Between April 10 - 13, Dr. Yang will offer Healing Qigong, Tai Chi Qigong, and Qigong Massage seminars. Relax your mind and body, close your eyes, and imagine kick boxing techniques or simpler images. Let your mind be vivid, but controlled. Learn that internal imagery is more important than external imagery. "Guided imagery is an important tool," says Tom Seabourne, professor of exercise science, "and should be practiced daily." Seabourne presents a six-minute video on YouTube with imagery techniques and tips that are often forgotten by many athletes who fail to recognize its importance and benefits. YMAA Boston was recently invited to perform at Brown University's Chinese New Year's banquet. The 15-minute performance included kicks, weapons, and matching sequences. The team performed White Crane, Long Fist, Praying Mantis, and some martial applications. There were 10 students total in the demo team. Watch the video here. An extraordinary experience to Korea from July 10-17, 2010 will be sponsored by the Chosun Taekwondo Academy. Train with world renowned grandmasters; visit the Kukkiwon in Seoul, and Buddhist shrines. Join Grandmaster Richard Chun and Master Doug Cook and their students on this unforgettable journey that will change the way you view martial arts forever. For more information visit the www.chosuntkd.com website and the Korea Training & Cultural Tour page. Rob Robideau interviewed Rory Miller about his book, Meditations on Violence. Robideau said the book "combines wealth of content with good writing." The interview touched upon why Miller wrote this book, the difference between learning martial arts and applying it to real life violence, and the need to know how bad guys think. Miller is interviewed about 30 minutes into the podcast. Rory Miller Presents Seminar "Ambushes & Thugs"
Rory Miller, author of Meditations on Violence, will give a seminar "Ambushes & Thugs" at the MCC: Blue River Community College, 20301, E. 78 Highway, Independence, Mo. on Saturday, March 20, 2010 from 9 a.m. to 5 p.m. Miller will cover efficient movement, power generation, counter ambush, environmental fighting, and more. Miller is donating his time and all proceeds will benefit the Single Parent Book Loan Program at the college. The seminar is sponsored by the Blue River Martial Arts Club. Fee $40. For information about registration and hotel accommodations contact Eric Parsons, teacher and club instructor, at (816) 604-6746 or eric [dot] parsons [at] mcckc [dot] edu. The Redwood Times newspaper website has posted an article by Virginia Graziani about Dr. Yang and the YMAA Retreat Center. "Nestled in the hills above Salmon Creek west of Miranda, the Yang Martial Arts Association Retreat Center is possibly better-known throughout the world than it is in Southern Humboldt. Dr. Yang, Jwing Ming, founder of YMAA, hopes to change that by reaching out to the community, inviting residents to participate in training and sending his students to teach others in local schools." Get a modern education on violence, and how to stay safe in today's world. Lawrence A. Kane, co-author of The Little Black Book of Violence: A Handbook for Young Men, tells Dr. Helen "how to get schooled now and skip the hard knocks" in the video interview: Getting Smart About Fighting Right. 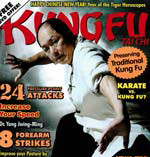 Dr. Yang, Jwing-Ming is featured on the cover of the March 2010 issue of Kung Fu Tai Chi magazine, on newsstands Feb 2nd. The Chinese New Year issue has an emphasis on preserving traditional Kung Fu and an article about increasing your speed. The magazine has been a great supporter of the YMAA Retreat Center, featuring several articles about the Center and others written by the Retreat Center disciples. Big thanks to Gene Ching, Gigi Oh, and everyone at Kung Fu Tai Chi magazine. Liu He Ba Fa (Water Boxing) will be offered by John Loupos, M.S., C.S.E., on Saturday, January 23 and Sunday, January 24 at the Jade Forest Kung Fu/T'ai Chi, Jonathan Livingston Plaza, 130 King St., Rt. 3A, Cohasset, Mass. This is the first installment of three of this rare form. In Chinese lore, Liu He Ba Fa is known as Water Boxing, due in part to its hybrid nature. It is derived from Tai Chi (water), Hsing Yi (ice), and Ba Gua (mist). The fluid form is practiced like a bubbling brook, sometimes slow, deep, and meandering, and other times rapid and coursing, even violent. The course will appeal to both internal and external martial artists and is guaranteed to raise your skill to much higher levels, especially in regard to your power of intention. Applicants can commit themselves to the first installment of this three-part of study with a deposit of $50 (or payment in full). Part 1 meets Jan. 23 and 24. Part 2 will be held this spring, and Parts 3 & 4 combined will comprise our annual summer camp. Costs will be $350 for each of the first two installments. You can save $50 on your first installment by prepaying in full by January 10. Room & board is on first come basis at $50/night. For further information, contact John Loupos at (781) 383-6822, jadeforest [at] comcast [dot] net, or visit www.jfkungfu.com.